It looks increasingly like the ‘new normal’ to try and get the courts to decide what national electricity generation policy should – or should not – be, by promoting ill-founded paranoia that blames humans for climate variability. Security of supply versus shaky ideology. 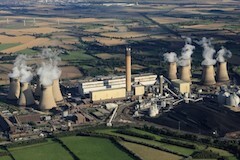 ClientEarth objects to Drax Power’s new gas power project, on the grounds that it breaches the government’s planning and climate change recommendations. Environmental law charity ClientEarth has submitted a written objection to Drax Power’s plans to build four new gas turbines, which – if approved – will risk locking in high-carbon energy on the grid until 2050. ClientEarth’s intervention comes just weeks after the historic report from the UN’s Intergovernmental Panel on Climate Change (IPCC) detailed the drastic carbon emission reductions needed to ensure the planet keeps global warming below 1.5 degrees Celsius. ClientEarth climate accountability lawyer Sam Hunter Jones said: “The UK government claims to be a climate leader, yet if major energy projects such as this from Drax are granted planning consent, the UK will risk carbon lock-in that would seriously undermine its ability to meet its climate change commitments. Lawyers should be banned from pontificating upon climate matters on the basis that their rule based logical process is totally different from the scientific reality. You can have cheap, reliable, always on electricity or very expensive, unreliable, only there when the wind blows or the sun shines ‘green’ electricity – you can’t have both. The first leads to a countries prosperity and a higher standard of living for all. The second leads to a country becoming a deprived third world nation. Unfortunately, the members of the green blob do not understand these realities because they live in a dream world where unicorns romp and the elite live in luxury. As an aside it would appear that Drax has realised that burning wood chips to generate electricity is not efficient or sustainable but using the local shale gas is. Drax already burns several million tonnes of wood pellets a year. 1) they may not have the logistics to do a lot more – transport, storage, availability of supply etc. 2) gas makes a lot more sense – plenty of supply, easy to use. Chris Huhne – the disgraced environment minister – walked out of jail and into a top position in the company that manages the shipping of those wood pellets. And we’re actually funding ClientEarth from our aid budget! Check who the objectors are and cut their electricity supply off in the name of reduced emissions. I like Ve2’s idea! Actually just put a randomizer on their meters and let the electricity flow in concert with the unreliable wind and solar. I like Ve2’s approach too. Whenever there’s a supply shortage, let the green objectors take the brunt of it. Can’t have the cake and eat it too.